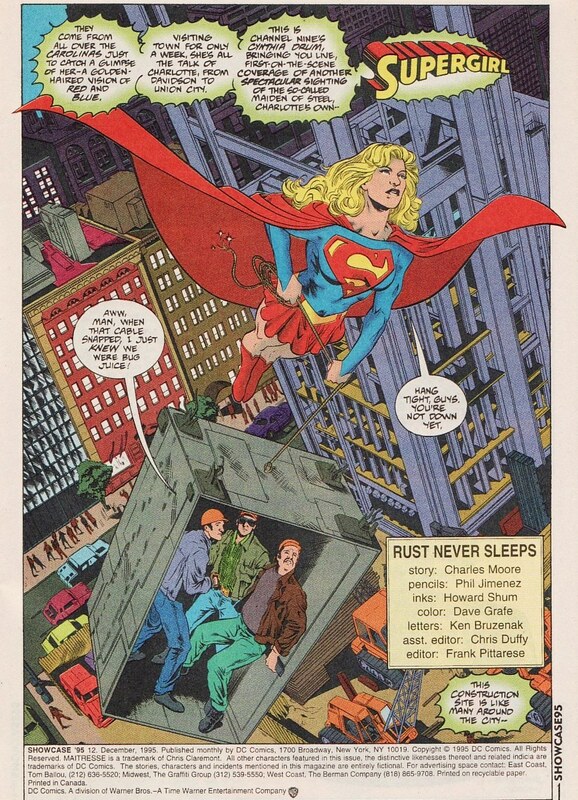 For the past couple of months I have been devoting Mondays to the Matrix Supergirl, covering her introduction to the DCU by John Byrne, to her more solid re-introduction to the universe by Roger Stern and Jackson Guice, to her mini-series, and then to her solo stories thereafter. 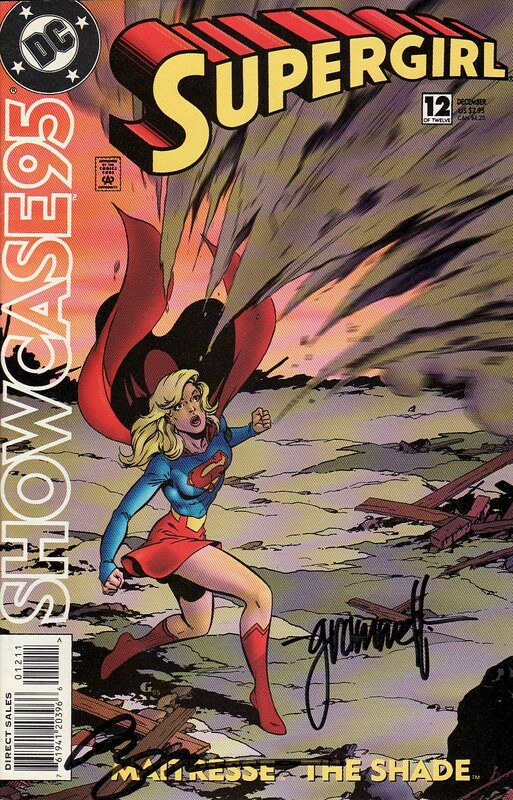 Today I conclude this dedicated look with Showcase '95 #12. 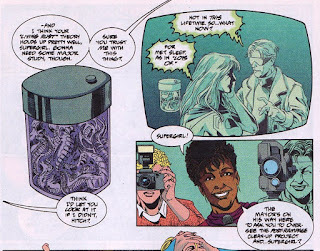 This story follows the Dichon story which was told in Showcase '95 #1 and 2 (reviewed here last month). 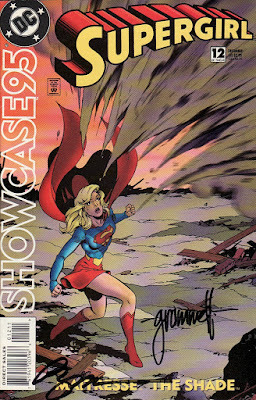 The next solo story after this is in Showcase '96 #8, a prelude to the Peter David Supergirl book. 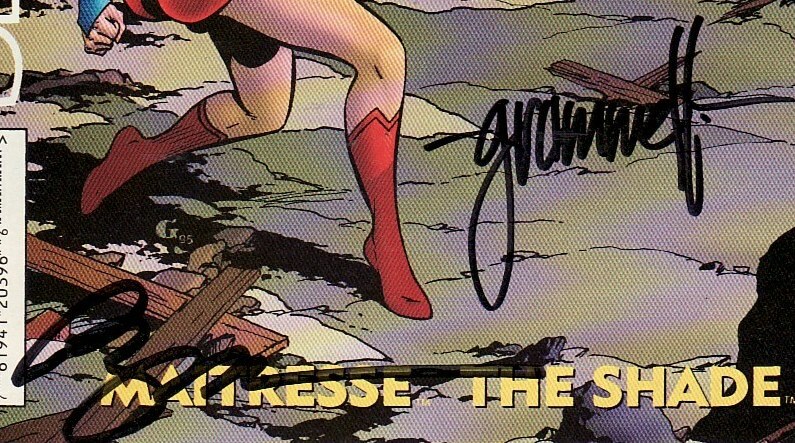 So this issue sort of is the capstone for the Matrix Supergirl. Sure, she continued to flit in and out of the Superman books. But for now, I think I will put the Matrix Monday idea on hiatus. So let's see where 1995 left this Supergirl. Before we jump in, figured I'd showcase (pun intended) that I have had the luck of getting this issue signed by Tom Grummett (cover artist) and Phil Jimenez who did the pencils on the Matrix story inside. We open with a nice splash page of Supergirl hauling an elevator with construction workers to safety. A voice over on the airwaves says that Supergirl is visiting Charlotte North Carolina and has become a big hit. Jimenez draws everything beautifully but this is a great shot with nice perspectives. 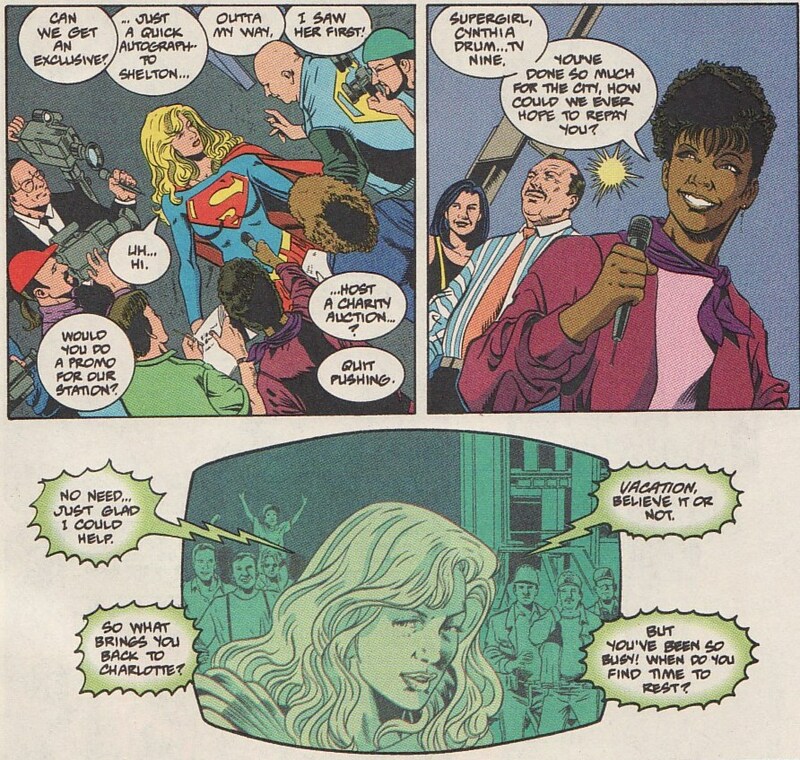 After dropping the men safely on the ground, Supergirl is suddenly mobbed by well-wishers, fans, and newscasters. When asked why she is in Charlotte, Supergirl says for vacation, but the haggard look on her face shows there has been little rest. But there is little rest for the weary. Hitch, one of the Bone Dagger Lab techs from the Dichon story, approaches. First he insults her by saying she looks terrible. Not a great beginning but I guess the point that Supergirl looks exhausted is being hammered home. Then he says the reason why he has come to her. The wreckage from Dichon's ship back in Showcase #2 has landed on the site of a water main. The city is pushing forward without clearing away the alien tech. Hitch is worried about contamination. This looks like a job for Supergirl! Even though she is fatigued, Matrix can't let it go. She scoops up Hitch and heads to the site. It is an interesting conversation on the way. Hitch tells her she needs downtime for herself. She says saving people is what she loves, it isn't work. But it is her thoughts that strike me. 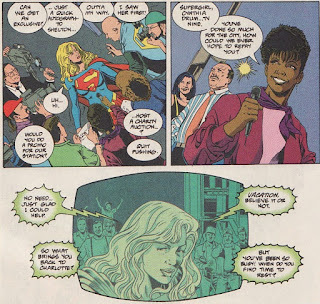 Did Matrix Supergirl really have the need to prove herself outside of Superman's shadow? That sounds more like a Kara thing. I also like how the flying Supergirl is 90 degrees opposite of the lower panel border. It gives the flight iimage a dizzying sort of feel. Turns out Hitch was right to be worried. But not about contamination. A living sort of rust monster crawls out of the ship and begins devouring/eroding/disintegrating all nonorganic material before it. 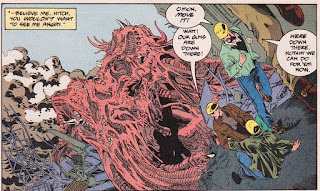 It looks more like a gibbering mouther from Dungeons and Dragons. It is a good thing that Supergirl is there. This rust beast keeps growing and even though it can't directly burn people it can cause enough property damage to potentially injure them. In a nice bit of classic super-stuff, Supergirl has to catch and carry an elevated walkway between buildings. It has the feel of Superman hoisting a bus or a train car. But you can see the collateral damage that is being unleashed, water mains are burst. Things are on fire. People are running around. And between direct damage and a nearby spark, a gas truck explodes. In an interesting new use of her telekinetic blasts, Matrix whirls up, in essence, a force field bubble. It takes tremendous will to use her power in this novel way. She flies up into the sky to release the concussive force, but she is bothered on the way by a newscopter trying to get up close footage. 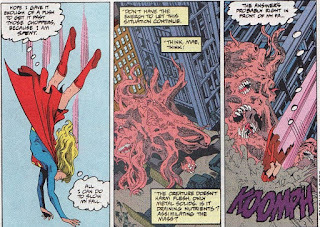 I don't know if we ever saw Supergirl use her powers like this again. 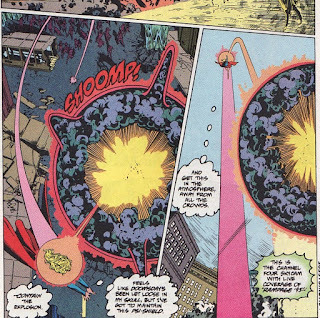 In fact, that whole psi-shield bubble takes so much out of her that she basically freefalls down to the surface crashing into an embankment of sand at a construction site. I suppose this is a Matrix Supergirl still learning. While it seems a little weird for her to have such an embarrassing thing happen to her in a rare solo story, I think it shows just how new she is to the game. And interesting that her inner name is 'Mae'. 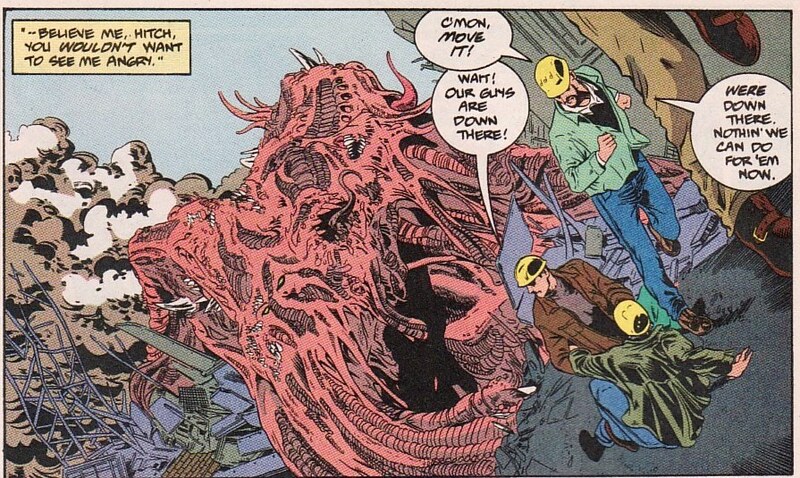 Remember, there is a giant rust monster comprised of mouths lurching through the city. Still, people flock to the new hero in town, Supergirl. It gets to the point that she has to literally toss them out of harm's way. 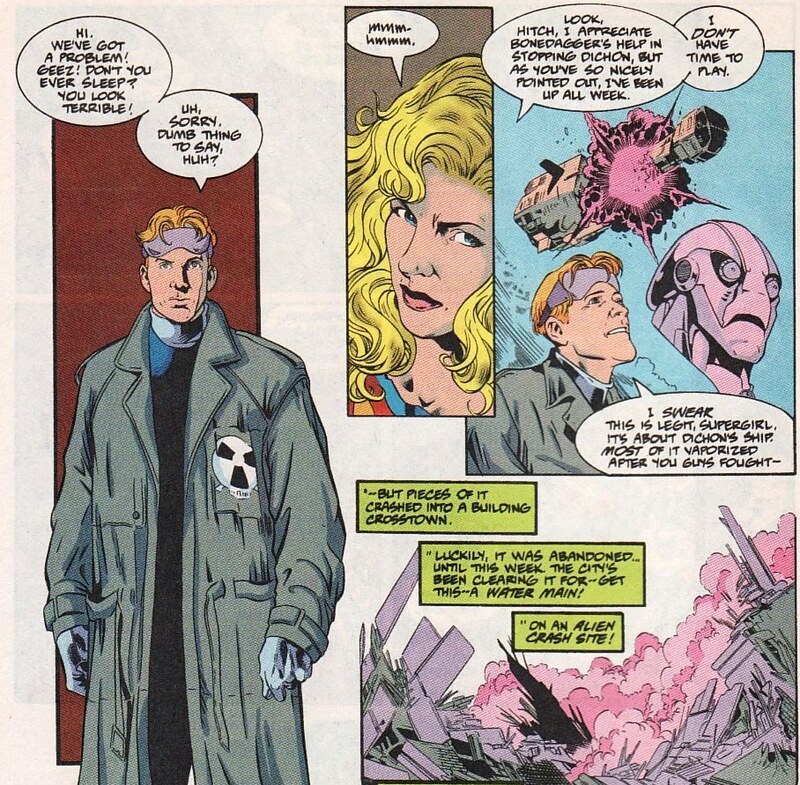 That top panel is about the most Phil Jimenez shot I have seen in this story. Love it. 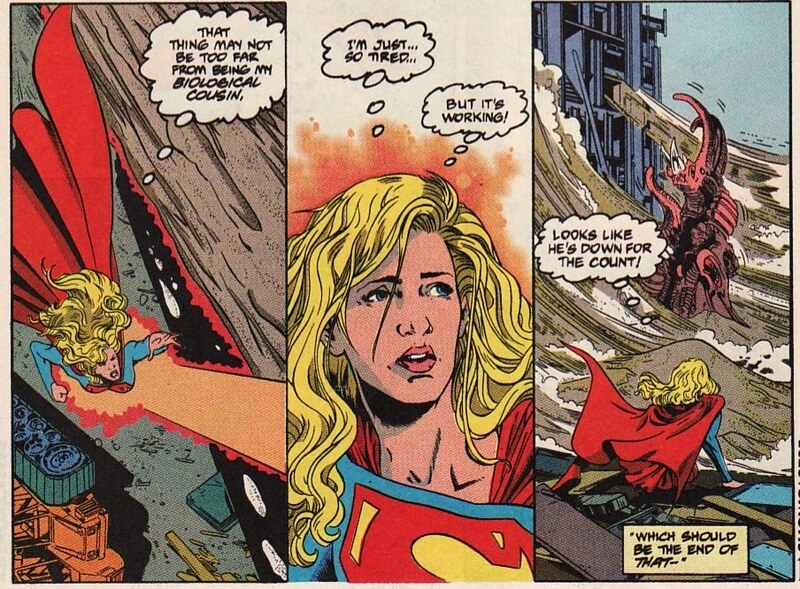 And I like that Supergirl understands that Charlotte isn't used to monster attacks the way Metropolis is. These people don't mean to endanger themselves. They don't know what to do. 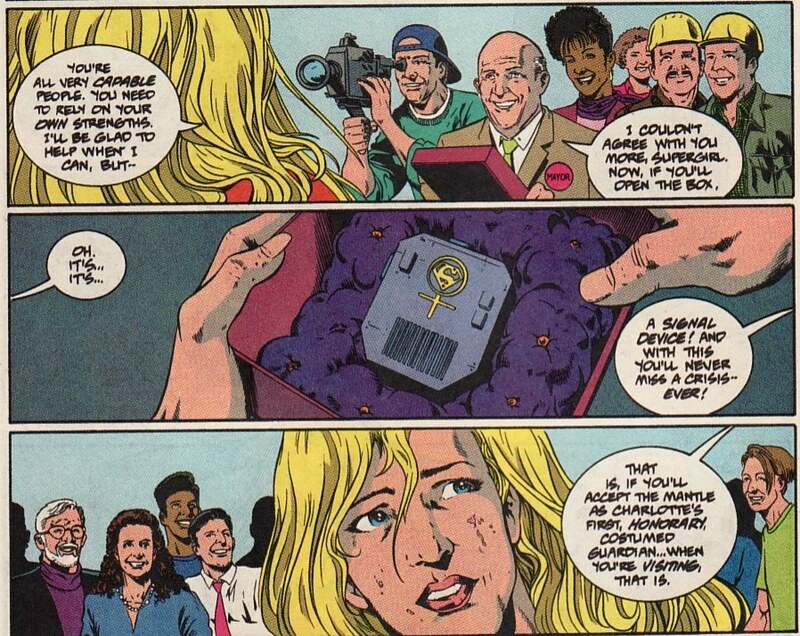 But all the events of the day lead Supergirl, finally, to the idea that this thing is akin to a living rust. And the best way to stop rust is to sandblast it. She uses her telekinetic blasts to flay this thing in a sandstorm, whittling it down to nearly nothing. And so ends the big threat. 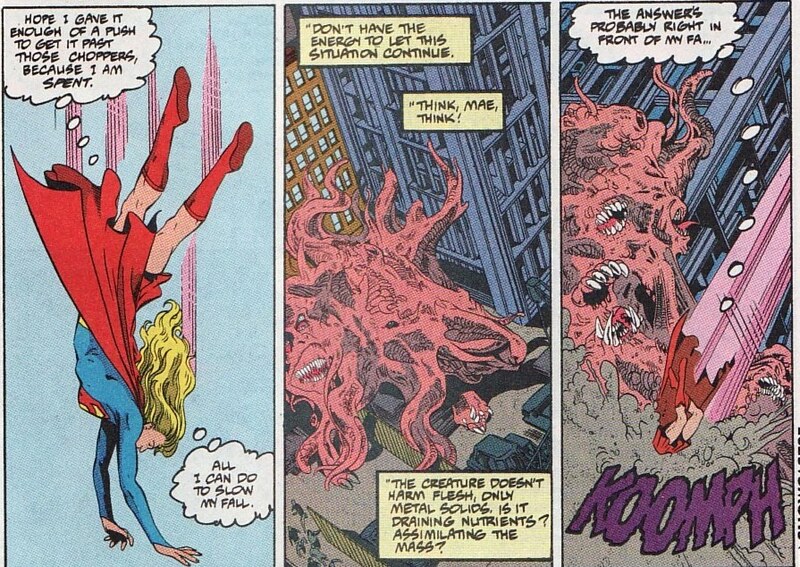 With the tiny living remains of the rust monster jarred and handed to Hitch, Supergirl can get to her vacation. But she can't catch a break. Just as she is about to fly off to sleep, she hears the Mayor is coming. In an awkward moment, she tells the city she cannot stay. In the few days she has been there they have come to rely on her too much. And she needs to rest. It all seems to be premature. The Mayor instead names her Charlotte's Honorary guardian. He gives her a signal device so they can summon her only when she is in town and able. 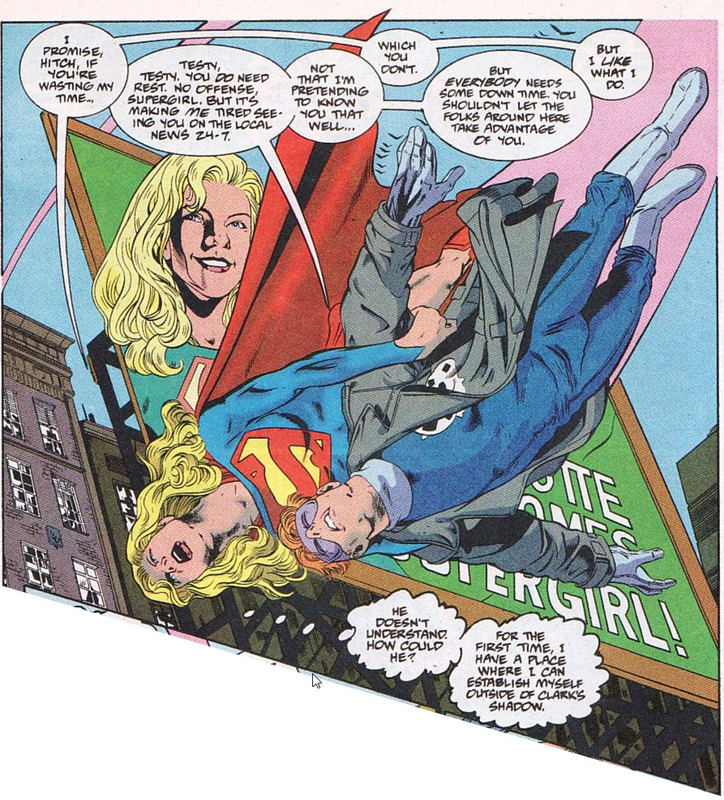 It all ends with a chuckle as Supergirl says she is going to fly off to sleep for a long time, getting the rest she needs. Okay, outside of a new use of her psionic powers, this is a simple story. 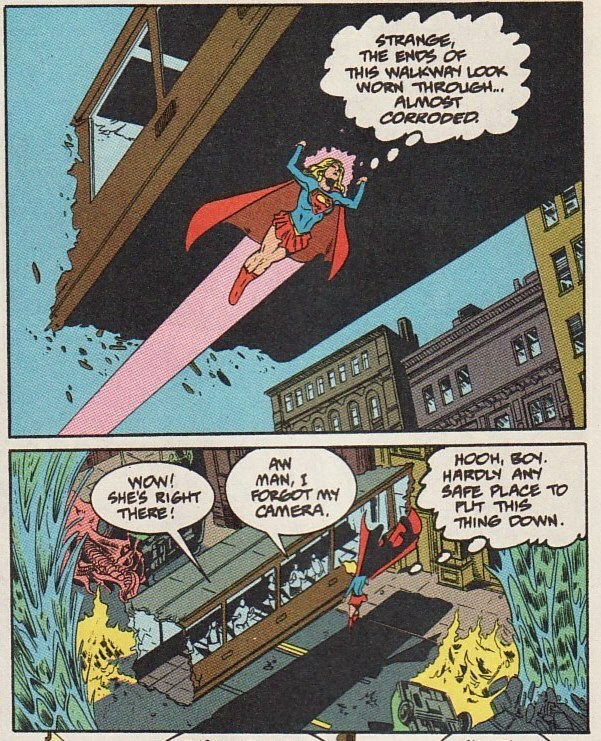 I do like the idea of a city courting Supergirl to be their hero and then overdoing it. 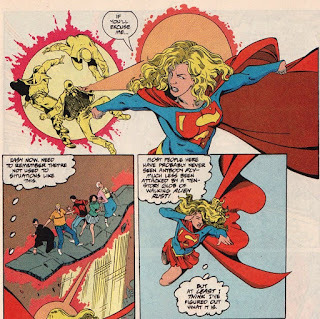 And it is interesting to hear Supergirl say she wants to be like Superman, but be out of his shadow, and then regret seeing all the adulation being heaped on her. As I said, this Matrix was still naive to this solo adventurer business. She wasn't used to being on her own. So no surprise their is a little bit of turmoil. And seeing Phil Jimenez art on a Supergirl story is a treat. I guess all this is my saying that this is worth picking up if you see it in the bargain bins. And remember, just 8 months later, Peter David really shook things up. It's not a bad story and I certainly like the art, especially that most Phil of Phil panels. I wonder if Charles Moore was pitching a series set in Charlotte (Charles/Charlotte, hmmmm). Didn't 'Mae' come from her time with the Kents? Thanks for this series, but how do you follow it? Supercat Sundays? Cities court industries, why shouldn't they court super heroes? 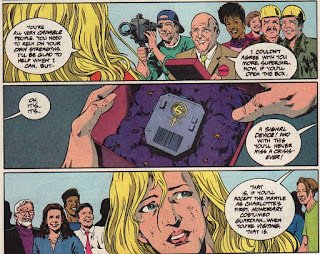 But this is nothing new, back in Superman Family Dollar Book Days, Ed Koch is clearly depicted as welcoming Supergirl to NYC when Linda Danvers got the diva-vixen part on the daily soap opera "Secret Hearts". Agreed, the art is good! I was just wondering if your reviews of older books like this ever get included in the full archive at comicbookroundup.com. There are entries there for Showcase '93 and Showcase '94 - but no reviews and therefore no ratings for those years. And there's no entry at all for Showcase '95. But in general, they do have a huge archive of back issue reviews, for each publisher's All Series section. Some of the archive would simply be from the inclusion of now-discontinued titles that were reviewed since the time the site began. But there are 1101 titles in All Series - has the site really been around that long, or are old reviews folded in as they appear? I like to read reviews of old stuff there, and think your very comprehensive and observant reviews should absolutely be included. Great idea, they be lucky to have Anj’s reviews up there! I have 2106 reviews sitting on my blog, Too Dangerous For a Girl (including pretty much every Supergirl for the past several years) but because I don’t give a rating, I’m ineligible. Boo! Red Daughter Poll: What Will Happen To Her?